It is no more than one century since ordinary Japanese people started eating beef, but we are now enjoying it almost every day. While the standard Western menu items such as beef stake or hamburger are very popular among us, we have developed our original menu items using beef. Sukiyaki is probably the most famous one, but we have some other great variations. Shabu Shabu is one of them. 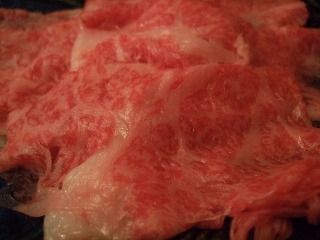 It is considered to be one of the highest class and therefore the most expensive menu items in Japan. Paper thin sliced beef is served on a large dish and we pick up one piece of them with chopsticks and dip it in boiling broth for our selves on a table. "Shabushabu" is the Japanese onomatopoeic word which we hear while dipping and shaking the sliced beef in the broth. As you can see in this picture, the beef has a lot of fat which is well scattered in the lean meat. Different from most Western people, we prefer this marbled beef. Some farmers in Japan massage calves giving them a lot of beer in order to get better marbled beef. If you came to Japan, I recommend that you should try Shabu Shabu instead of Sukiyaki.